Interested in upgrading your eyeballs? Well, a team of DARPA-funded researchers led by Joseph Ford of UC San Diego recently published a proposal for a new type of telescopic contact lens in Optics Express. Designed for people with age-related macular degeneration, the lenses are only 1.17mm thick and can magnify images up to 2.8 times. Their layered construction admits light near the outer edge of the lens, bouncing it across a series of tiny aluminum mirrors before transmitting it to the back of the retina, kind of like the origami-optics lens. Telescopic sight can be toggled on and off by using a pair of 3D glasses to switch the polarization of the central part of the lens. It sounds promising, but the lenses -- pictured after the break -- currently have some obstacles, like gas-impermeable materials unsuitable for long-term wear and sub-par image quality. Want to read more? Pop on your glasses and check out the full paper at the source link below. Slimmed-down telescopic contact lens switches between magnified and normal vision using a modified pair of liquid crystal eyeglasses. WASHINGTON, June 27, 2013-Contact lenses correct many people's eyesight but do nothing to improve the blurry vision of those suffering from age-related macular degeneration (AMD), the leading cause of blindness among older adults in the western world. That's because simply correcting the eye's focus cannot restore the central vision lost from a retina damaged by AMD. Now a team of researchers from the United States and Switzerland led by University of California San Diego Professor Joseph Ford has created a slim, telescopic contact lens that can switch between normal and magnified vision. With refinements, the system could offer AMD patients a relatively unobtrusive way to enhance their vision. The team reports its work today in the Optical Society's (OSA) open-access journal Optics Express. The team is currently pursuing a similar design that will still be switchable from normal to telescopic vision, but that will use gas-permeable materials and will correct aberrant color without the need for grooves to bend the light. They say they hope their design will offer improved performance and better sight for people with macular degeneration, at least until a more permanent remedy for AMD is available. 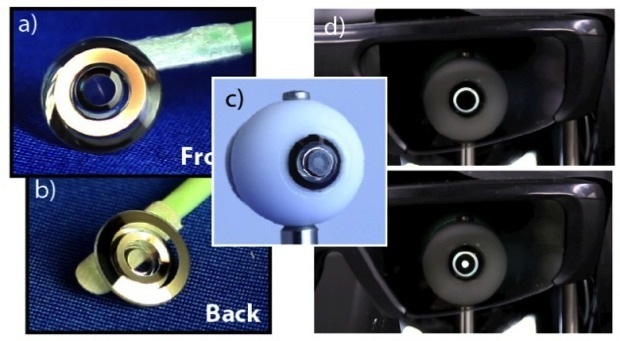 Paper: "Switchable telescopic contact lens," E. Tremblay et al., Optics Express, Vol. 21, Issue 13, pp. 15980-15986 (2013).